Stratford School Academy provides an excellent quality education to the diverse community it serves. Beetlebrow's impressive portfolio of school sites helped to persuade Stratford to come on board. 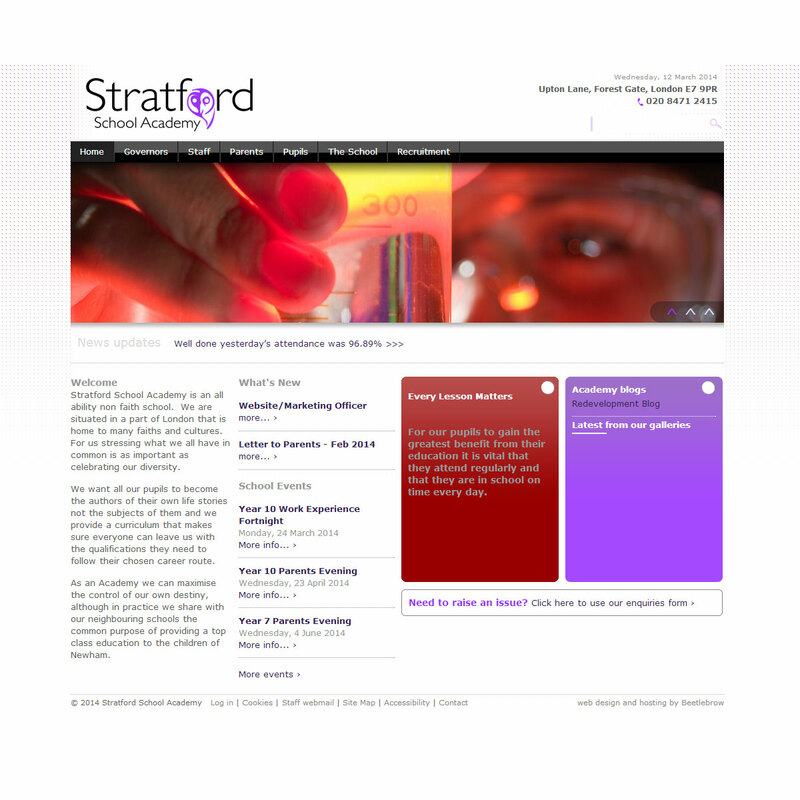 The Stratford School Academy wanted a complete online and offline rebranding to go with their change to academy status. After extensive consultation, Beetlebrow created a new logo and used this on a variety of media for the school including stationery, signage around the school and a brand new, redesigned prospectus. At the same time, Beetlebrow produced a redesigned web site co-orindated with the new printed materials, brings everything bang up to date. The web site has a lot of material and is easy to keep up to date with the Beetlebrow Plone-based content management system. The site makes good use of the Beetlebrow video-embedding system to showcase school videos. The homepage features a selection of the latest content from the site, along with a news feed of education news direct from the BBC web site. Governors of the school also have access to a password-protected extranet giving them news, documents and information about the school.